Drotaverine hydrochloride (DRH) is chemically known as 1-[(3; 4-[diethoxyphenyl) methylene]-6; 7diethoxy-1; 2; 3; 4 –tetrahydroisoquinolene hydrochloride. Drotaverine hydrochloride is highly potent spasmolytic agent. Aceclofenac [AF] is chemically designated as 2-(2; 6-Dichloroanalino) phenyl acetoxy acetic acid. It is a NSAID; used in the management of osteoarthritis; rheumatoid arthritis; and ankylosing spondylitis. A few UV spectrophotometric and HPLC[4-7] methods have been reported individually or in combination with other drugs for estimation of DRH. The aim of present study was to propose a simple and sensitive method for quantification of DRH and AF to validate the procedures in order to demonstrate its good analytical and statistical parameters. The chromatographic separation was achieved on a Shimadzu high-pressure liquid chromatographic system equipped with a binary LC-20AD solvent delivery system; SPD-20A Photo Diode Array (PDA) detector and SIL-20ACHT injector with 50μL loop volume. The LC solution version 1.25 data acquisition system was used for data collecting and processing (Shimadzu Corporation; Japan). Thermo C18 (250 mm × 4.6 mm i.d. ; 5.0μ) column was used for the analysis (Thermo scientific; USA). The HPLC grade of acetonitrile and ammonium acetate was obtained from Merck; Darmstadt; Germany. A molecular biology grade chemical of ammonium acetate was obtained from System Laboratory Chemicals and Reagents; Malaysia. Analytical grade of potassium dihydrogen phosphate was obtained from HmBG. Preparation of the calibration standards and quality control (QC) samples: The 1.0 mg/ml stock solutions of DRH and AF were prepared using mixture of water and methanol (1:1) solution. The working standards of DRH (at the concentration of 50; 60; 70; 80; 100 and 120 ng/ml) and AF (50; 60; 70; 80; 100 and 120 ng/ml) were prepared from stock solution. The QC samples at three different levels viz. ; 60; 80; 120 ng/ml and 200; 400 and 700 ng/ml were prepared and stored at 2-8°C until analyzed. Sample preparation for analysis: Twenty tablets; each containing 80 mg of DHR and 100 mg of AF were weighed and finely powdered; a quantity of powder equivalent to 80 mg and 100 mg of combined dosage form were weighed and transferred to a sintered glass crucible. To this 5.0 ml of 1.0 mg/ml solution of dexibuprofen (internal standard/IS) was added and the drugs were extracted with three quantities; each of 20 ml of mixture of methanol and water (1:1 v/v). The combined extracts were made up to 100 ml with mobile phase and further dilutions were made and this solution was used for the estimation (Figure 1). Chromatographic conditions: Reverse phase RP-HPLC method was used for standardization of DRH and AF. The mobile phase used was acetonitrile and 5mM ammonium acetate (pH 4.5); in the ratio of 65:35 % v/v. The mobile phase flow rate was maintained at 1ml/min and the injection volume was 25 μl. The analytes was detected using PDA at 285 nm. The method was validated for linearity; precision; accuracy specificity; short-term stability; and system suitability. Standard plots were constructed in the range of 50; 60; 70; 80; 100 and 120 ng/ml of DHR and 100; 200; 300; 400; 500; 600 and 700 ng/ml of AF in triplicates to test linearity and it evaluated by linear regression analysis. The precision of the assay was studied with respect to both repeatability and intermediate precision. Repeatability of the assay was assessed by six replicate injections of freshly prepared standard solution in same equipment on same day. Intermediate precision of the assay was assessed by assaying freshly prepared solution at the same concentration additionally on two consecutive days. Peak area ratio of standards to that of IS were determined and precision was reported as % R.S.D. Method accuracy was tested for its percentage recovery and percentage R.S.D. of individual measurements by analyzing samples of DHR and AF at three different levels in pure solutions using three preparations for each level. Specificity was assessed by comparing the chromatograms obtained from sample of pharmaceutical preparation and standard solution with those obtained from excipients which take part in the commercial tablets and verifying the absence of interferences. The short-term stability of the sample solution was tested at ambient temperature (22 ± 1°C) for three days. A system suitability test was performed by six replicate injections of the standard solution at a concentration to verifying IS/DI resolution > 2; % R.S.D. of peak area ratios of drugs to that of IS ± 2%; % R.S.D. of each peak retention time ± 2%[8,9]. 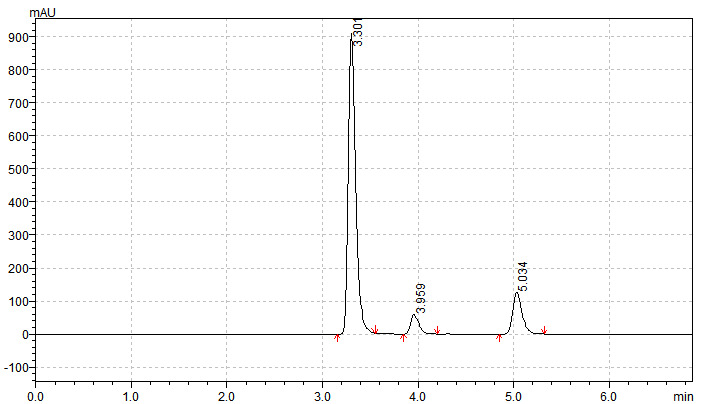 The method specificity was assessed by comparing the chromatograms obtained from the drug with the most commonly used excipient mixture with those obtained from the blank solution. The blank solution was prepared by mixing the excipients in the mobile phase without the drug. The drug to excipient ration used was similar to that in the commercial formulations. The commonly used excipients in formulations like lactose; starch; microcrystalline cellulose; ethylcellulose; hydroxypropyl methylcellulose; magnesium stearate and colloidal silicon dioxide were used for the study. The mixtures were filtered through 0.45 μ membrane filter before injection. The recovery study is presented in Table 1. Precision is the degree of repeatability of an analytical method under normal operational conditions. The precision of the method was studied in terms of repeatability (intra-day assay) and intermediate precision (inter-day assay). Method repeatability was studied by repeating the assay 3 times in the day for intra-day precision and intermediate precision was studied by repeating the assay on three different days; three times on each day (inter-day precision). The intraday and interday variation for determination of ceftazidime was carried out at 3 different concentrations levels.% RSD values were calculated (Table 2 & 3). The study was conducted to determine the effect of deliberate variations in the optimized chromatographic conditions like composition of the mobile phase; flow rate and pH of the mobile phase. The effect of these changes on the system suitability parameters like tailing factor and the number of theoretical plates and on assay was studied. A single condition was varied at a time keeping all other parameters constant like; variations in the composition of the mobile phase; variations in the pH of the mobile phase and variations in flow rate (evaluated at 1.4 ml/min). A study to establish bench top stability was conducted. A freshly prepared working standard solution (100 μg/mL of the drug) was analyzed immediately and at different time intervals. The tailing factor; theoretical plates and difference in percent assay at different time intervals were calculated. LOD is defined as the lowest concentration of analyte that gives a measurable response. It is determined based on signal to noise ratio (S/N) of three times typically for HPLC methods. LOQ is defined as the lowest concentration that can be quantified reliably with a specified level of accuracy and precision. It is the lowest concentration at which the precision expressed by a RSD less than 2%. System precision and System suitability studies were carried out by injecting six replicates of the working standard (Table 4). The proposed RP-HPLC method is rapid; specific; accurate and precise for the quantification of DHR and AF from its tablet dosage form. The method has been found to be better than previously reported methods; because of its wide range of linearity; use of readily available mobile phase; lack of extraction procedures and low tR. All these factors make this method suitable for quantification of DHR & AF in tablet dosage forms. The method can be successfully used for routine analysis of DHR and AF in quality control; bulk drugs and pharmaceutical dosage forms without interference. 1. Oneil M.J., Smith A., Heckelman P.E. The Merck Index, 13th ed (2001) Merck, Whitehouse Station. New Jersey: 3489. 2. Chitlange S.S., Ranjana S., Wankhede S.B., Kulkarni AA. Spectrophotometric methods for simultaneous estimation of nimesulide and drotaverine (2009) Intern J Chem Tech Research 1: 135-138. 3. The Merck index an encyclopedia of chemicals, Drugs, and biologicals 13th ed. (2001) Merck Research Laboratories, Whitehouse station. New Jersey: 609-610. 4. Dahivelkar P.P., Surana S.J. Spectrophotometric method for simultaneous estimation of drotaverine hydrochloride and mefenamic acid in bulk and tablet formulation (2006) Indian Drugs 43: 896-900. 5. Ayad M.M., Youssef N.F., Abdellatif H.E., Soliman S.M. A comparative study on various spectrometries with thin layer chromatography for simultaneous analysis of drotaverine and nifuroxazide in capsules (2006) Chem Pharm Bull 54: 807-813. 6. Panigrahi D., Sharma R. Development and validation of an RP-HPLC method for simultaneous analysis of drotaverine and omeprazole in a tablet dosage form (2008) J Acta Chromatographica 20: 439-450. 7. Momin M.Y., Yeole P.G., Puranik M.P., Wadher S.J. Reverse phase HPLC method for determination of aceclofenac and paracetamol in tablet dosage form (2006) Indian J Pharm Sci 68: 387-389. 8. ICH-Q2B. Validation of analytical procedures: Methodology (1996) International Conference on harmonization of technical requirements for registration of pharmaceuticals for human use, Geneva, Switzerland.